Well these exams have now gone live and with that it means those that took them in the Beta format at MMS 2012 are starting to get their results. So I've passed the 70-247 exam, which I thought was the harder of the two due to the ammount of SCVMM questions that were in it and I'm still learning that product. I've still yet to hear the result of the 70-246, but my fingers are crossed! **Updated 15/06/2012 00:08** I've just checked again and Prometric have updated my history page and it looks like I've managed to pass 70-246 as well meaning I've passed BOTH the exams!! 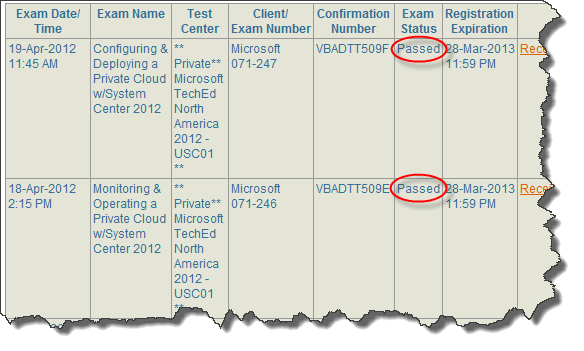 That's one step closer to getting certified as MCSE: Private Cloud. Thanks Peter and well done to you too. I've just checked again and yep, it's updated and I've passed 246 as well now!